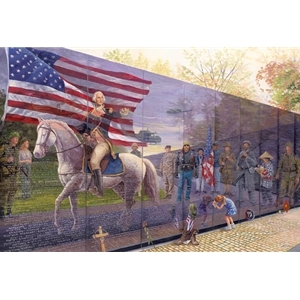 At first glance, you see George Washington saluting the troops of past and present wars. Every man and woman who has served our country to preserve freedom is to be honored. A few are pictured to represent them all. From left to right the soldiers represent a Vietnam Veteran, a Korean War Nurse, a soldier in Iraq/Afghanistan, a Persian Gulf Veteran, a living Vietnam Veteran, a Continental soldier, a Union Civil War soldier, a World War I Veteran, a Confederate Civil War soldier, a Vietnamese woman and baby, a World War II Veteran. As a court would review the evidence and reach a verdict, these troops are being honored for their service to our country. (Notice the word HONOR in the sidewalk.) On further inspection we find the real key to this painting. It is the Lord (in the upper right corner) who is truly “reviewing the troops”. We are to be counted as good soldiers of Jesus Christ. He is reviewing our lives. The ultimate question is do I recognize and trust him? The little girl is leaving a note at the Vietnam Veteran’s Memorial Wall. What do you think she is writing?